I actually managed to perfect my basic go-to pesto recipe years ago (you can find it here: www.thewrightfoodie.com/recipes/pumpkin-seed-basil-pesto) and I mindlessly make a batch every month or so to store in individual pots in the freezer. But this time, I thought I would try something different and I am SO pleased I did! It is honestly an absolute winner and pesto is so much more versatile than being just a traditional pasta sauce. It jazzes up a salmon fillet or a chicken breast, meaning you can whip up a fancy last minute meal in no time. A dollop of pesto is a great addition to a green vegetable soup or can double up as a dip for crudités. I even love it smeared on a seeded cracker with some tomatoes on top for a quick snack. I came to experiment with this recipe after discovering a whole host of beautiful rainbow tomatoes in my local greengrocer. Those of you who follow my recipes will already attest, I am an absolute sucker for different coloured fruits and veggies. So when I saw them, it was love at first sight. But there were so damn many of them, I didn’t know what to do with them all when I got home! So I tried my hand at making homemade ‘sun’-dried tomatoes. It was surprisingly easy peasy! All you need to do is halve the cherry tomatoes, place them on a roasting tray with a nice glug of olive oil, sprinkle your favourite herbs, and pop them in a pre-heated oven on 140 degrees for 2 hours. Obviously, shop bought ones do the trick but it was fun to experiment with making them myself. The actual pesto is super quick to make, all in the blender in less than 10 minutes flat. One serving provides 137 calories, 2g fibre, 3g of protein and 16% of your daily Vitamin C requirements. It is a great way to incorporate the nutrients from fresh herbs (did you know Basil contains antioxidants great for the immune system?) and the walnuts themselves are also rich in antioxidants and heart-healthy anti-inflammatory Omega-3s. · In a blender, whizz the garlic and walnuts together to form a paste — you may need to add a little of the oil to help get the blades going. 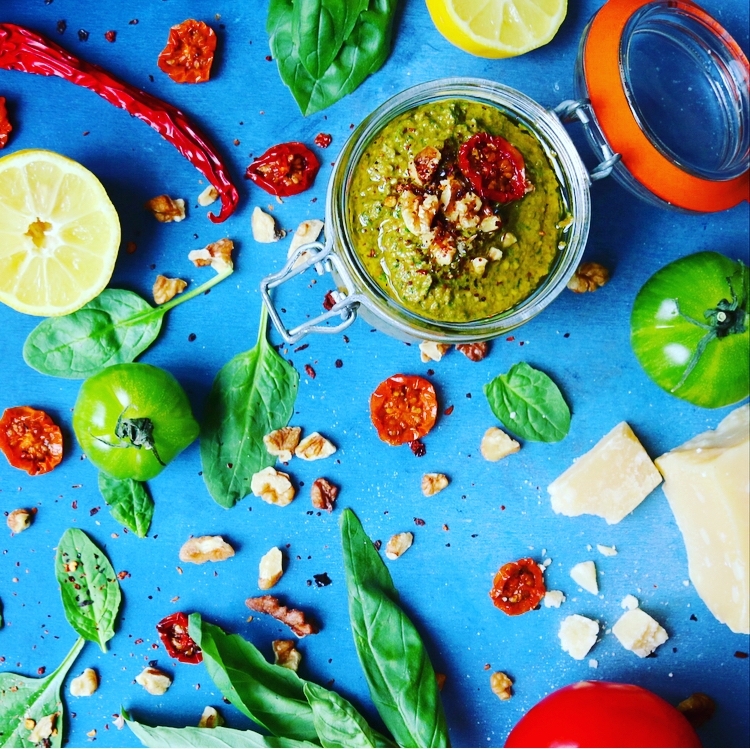 · You want to have a little texture in pesto so avoid blending it so much that it becomes a smooth puree. · Add the lemon zest, lemon juice, sundried tomatoes, apple cider vinegar and half of the oil; and blitz (again, not making it too smooth). · Only then add the basil and spinach leaves — this way, the pesto keeps it’s lovely green colour and doesn’t go brown like it does if you add the leaves at the beginning. Blitz again. · Finely grate the cheese and add it to the blender, then gradually pour in the remaining oil. It might need thinning with some water or more oil if desired. · Season well with salt, pepper and chilli flakes if using. · Store in a sterilised airtight glass container in the fridge or portion some out to keep in the freezer.